PLEASE NOTE: Turkey Season is upon us! So clearly it is the busy season for Hemlock Ridge Calls. Please be aware that all items ordered from us are custom made and shipped in the order they are received. Wait time for your order to be processed at this time of year may be up to two weeks in most cases. Hemlock Ridge Calls® offers only the highest quality, most realistic sounding calls. Whether you are coaxing in a wary Tom with subtle turkey talk, locating a gobbler from a windy Appalachian ridge top, trying to lure in a trophy buck, or bag a cunning and elusive predator, a Hemlock Ridge Custom Game Call™ will help you get the job done. Every call that leaves our shop is guaranteed to realistically duplicate the game you are hunting. 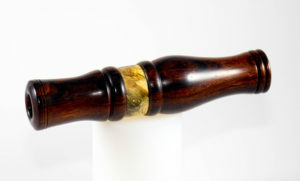 Ease of use, and exceptional tone quality and realism are the hallmarks of every Hemlock Ridge Custom Call.